For nearly a hundred years, these steel, grey-skinned battle wagons have fought off everything from Al Qaeda to dive-bombing Kamikazes. Some returned from the hell of war to become major tourist attractions for new generations. Others continue to patrol the world's trouble-spots ... read full description below. For nearly a hundred years, these steel, grey-skinned battle wagons have fought off everything from Al Qaeda to dive-bombing Kamikazes. Some returned from the hell of war to become major tourist attractions for new generations. Others continue to patrol the world's trouble-spots in America's latest war. HERO SHIPS profiles the complete combat history and evolving technology of a single American ship, often through multiple conflicts. These are the battleships, destroyers, aircraft carriers, submarines, and specialized ships that belong in the warship hall of fame. Archival footage and interviews are punctuated by all-access inspections of the ship's battle stations, conducted by young, active Navy sailors. 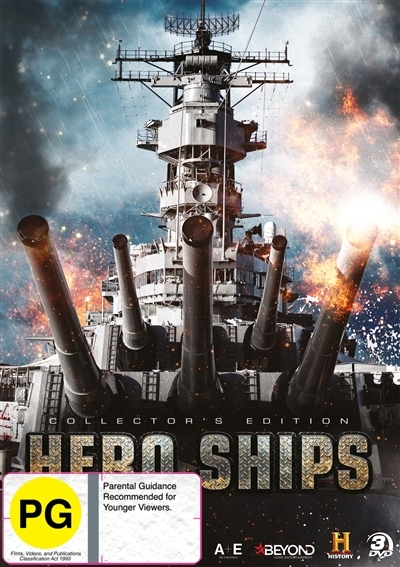 The series lets us understand the role of each weapon and technology, the dramas that unfolded in different rooms during the heat of battle, and the unique traditions and stories of each vessel.